This delicious one-pot meal requires only about 15 minutes of active prep time — and that's no blarney. Need a lazy Sunday dish to celebrate St. Patrick's Day? Chungah Rhee, author of "Damn Delicious Meal Prep", eats this Irish stew-inspired dish in her "no-shame sweatpants" with a loaf of crusty bread. The genius of this one-pot dish is that it can be prepped, cooked and on the table in under an hour — and only about 15 minutes of that time requires any sweat equity from you. The rest is all done in the Instant Pot. When the Instant Pot's cooking cycle is done, don't jump the gun and skip extra step of making the gravy. 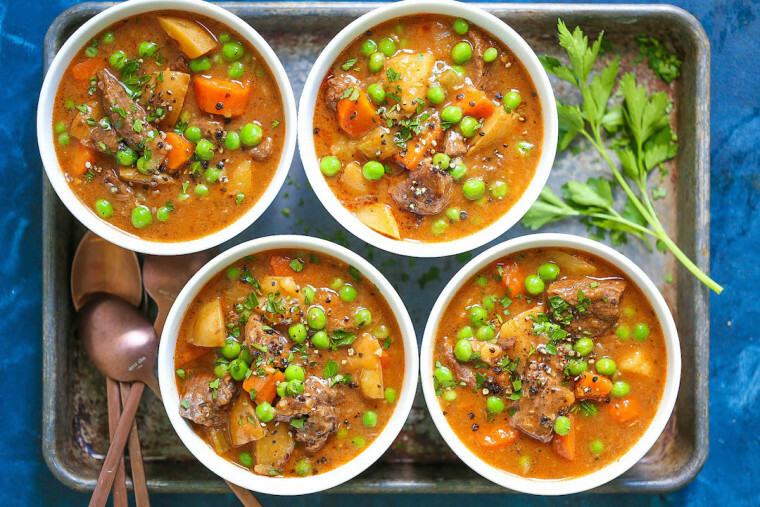 The addition of flour gives the stew a silken taste and texture that pairs nicely with those perfectly tender pieces of beef and vegetables. This recipe makes six servings and clocks in at just under 350 calories per serving, which leaves you a little extra wiggle room for a nice pint of Guinness. Slainte — and Happy St. Patrick's Day! Don't have an Instant Pot? Try this slow cooker version instead. Ingredient note: Dutch yellow potatoes hold up well in the Instant Pot, but you can substitute for any kind you have on hand. Season beef with salt and pepper, to taste. Set a 6-qt Instant Pot® to the high saute setting. Melt butter; working in batches, add beef and cook until evenly browned, about 2-3 minutes. Stir in potatoes, carrots, celery, onion, garlic, beef broth, tomato paste, Worcestershire, thyme, rosemary, paprika, caraway seeds and bay leaves until well combined; season with salt and pepper, to taste. Select manual setting; adjust pressure to high, and set time for 35 minutes. When finished cooking, quick-release pressure according to manufacturer’s directions. In a small bowl, whisk together flour and 1/2 cup stew broth. Select high sauté setting. Bring to a boil; stir in flour mixture and cook, stirring frequently, until slightly thickened, about 3-4 minutes. If the mixture is too thick, add more beef broth as needed until desired consistency is reached. Stir in peas until heated through, about 30 seconds. Want more recipe ideas from Chungah Rhee from Damned Delicious? Check out our Facebook Live about healthy meal prep.